This is the third edition of the WTII label sampler series and the first issue that will be a digital only release. 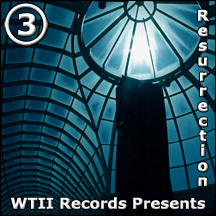 Resurrection 3 features new and exclusive tracks from The Gothsicles, Monstrum Sepsis, The Thought Criminals, PTI, cut.rate.box, Trigger 10d, State of the Union, Dessau, Stromkern, The Qualia and many more. Resurrection 3 provides a glimpse of what lie ahead for 2009 and beyond.